find out the relative strength of the mounts. 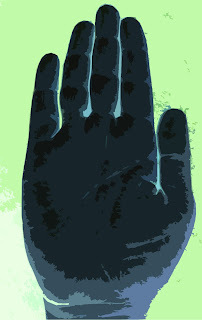 Once this is done, it is time to proceed with the interpretation of the other signs and lines (in the context of the overall hand). Fingers look very different from different angles and positions, and the right way to check their correct position is to ask the person to hold his hand in a natural way (but with the fingers held straight) and observe it from the front as well as the back. Repeat this several times so that you get the accurate position. Check the relative length of the fingers by asking the subject to hold them close together. The setting of the fingers and thumb is critical (whether low-set or high-set). If the hand reader makes a mistake here the reading can go wrong. If a finger is high-set and long, is the finger really long or of normal length? Do the qualities of an excessively long finger apply? Or if the finger is low-set, is the finger really short? Initially, actual measurements help. It is also important to not jump to conclusions and not go by just one mark and one sign. This is because hands often show contradictory signs. The worst thing to do is come to conclusions by examining one sign only. Even worse is not to take into account the type of hand. Many amateur hand readers do this, and this is what has made palmistry lose some of its credibility. Practising palmistry is difficult and takes years to master. Learning should never stop. What would you think of a doctor who told you had measles or smallpox because you had a rash on your body? You know that a doctor has to take into account all the physical symptoms as well as the medical history before making the diagnosis. 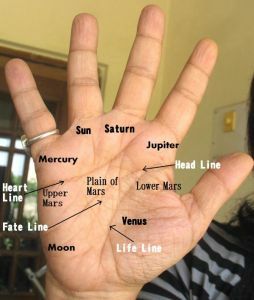 I have compared a palmist to a doctor in this post and to be more specific – the art of diagnosis can be compared to the art of reading hands. A good doctor has mastered the art of diagnosis. He has done this not only through his knowledge but also through his observation over the years and the correct and intelligent interpretation of symptoms, giving some symptoms more weight and some less. The art of palmistry can also be compared to the art of psychiatry. Here too the psychiatrist does not condemn a patient by telling him or her that he has schizophrenia because his family tells you that he acts in a contradictory or "crazy" manner. Neither does a psychiatrist say that a man is insane because he suffers from road rage. It is the person's background, his circumstances, the society he moves in, and his history which is taken into account before pronouncing a verdict. Also, various symptoms need to be considered. In the same manner, in palmistry or hand reading, one has to look at different signs, and read them together. One also takes into account the past (which can be seen from the hand) as well as the person's temperament (again seen from the hand) if one has to mention future trends. The circumstances and the society the person lives in is very important. When it comes to reading mounts, each individual mount needs to be compared to the strength of the other mounts. The mounts also need to be compared to the strength of the fingers. If all mounts are developed, the importance of a particular developed mount decreases. A hand-reader must know whether it is the lower, the middle or the highest part of the mount which is developed and this applies to Venus and Moon in particular. There is a different meaning attached to each. At times it is difficult to make out what part of the mount is developed or whether the development is medium or high, and in this case, checking the apex of each mount helps. One needs a high-resolution photograph of the hand to examine apexes. Only practise will tell you whether a mount is flat or well developed. Once you decide what type of hand it is, which mounts are developed, which fingers are high-set or low-set or long or short, then one can begin to study the lines. To read lines the same principles outlined above are to be used. Read lines in combination with each other and keep comparing their meaning to that of the mounts and fingers and the shape of the hand. Read the lines in their context. Also, study the consistency of the lines relative to each other. Whether one line is stronger than the other. Even with identical lines, no two hands will be the same because the shape of the hand will be different. The lines can reveal future trends, but then it is the lines which tend to change the fastest. So be careful before you predict anything. A person's future changes if he/she changes, and the younger he/she is, the higher the chance of the lines changing. The shape of the hand, the fingers and the mounts can also change, if a person is able to change a particular trait. How much control do we have over our future? or Can Palmistry predict behaviour? or Can Palmistry predict future events?